"A simple, refreshing salad that accompanies any type of food." 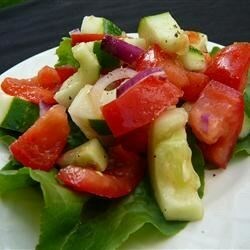 Combine tomatoes, cucumbers, and onions in a salad bowl. Season to taste with salt and black pepper. Sprinkle with lemon juice. Chill. This recipe had a few too many raw onions for my family's liking. If I made it again, I'd either omit or greatly reduce the amount of onion I'd use. Very simple to make! This is a delicious salad that tastes great with Indian food. I like to add some chopped fresh cilantro leaves or mint. Too many onions and it needed more than just a squeeze of lemon juice. We followed the suggestions below and it turned out great! Perfect cold salad on a hot summer day!